You might be sick to death of hearing about "supermoons." If that's the case, I bring good news: tonight, December 13, you'll see the final supermoon of 2016. If you're not sick of them, I also bring good news, because you have one more supermoon to see. Of course, where there is good news there is bad, and it's this: The supermoon will make it very difficult to catch the Geminid meteor shower, which peaks tonight. Don't give up, however; because of the sheer volume of meteors that comprise the Geminids, you might see some shooting across the sky. Before last year, when the red harvest supermoon took over the world, you might never have heard of a supermoon. And now we've had three in a row to close out the year: October's super hunter's moon, November's super beaver moon, and now December's full cold or long nights supermoon. This is true in part because supermoon is not an astronomy term, but rather, one of astrology. (In case you are wondering about the difference: astronomy is science; astrology is make believe.) The name has stuck of late because it's Twitter-friendly and a lot easier to remember than the actual name for the phenomenon: perigee-syzygy of the Earth–Moon–Sun system. If you want to understand what's going on and why there are so many supermoons recently, you really do need to look at the proper name. Perigee occurs when the Moon is closest to the Earth in an orbit. Remember: the Moon's orbit is not a perfect circle; rather, it's elliptical. Sometimes it's close to Earth. Sometimes it's farther away. Syzygy means three celestial objects are in alignment. (It can be the Sun, Earth, and Moon, but it might be the Sun, Venus, and Earth, for example, when astronomers can view Venus cross the solar disc.) So when do the Earth, Sun, and Moon experience syzygy? In one of two instances: either the Moon is between the Sun and the Earth (that's a new moon, because from our vantage, the Moon is completely black; the far side of the Moon is in full illumination) or the Earth is between the Sun and the Moon (a full moon, when the Sun's rays are lighting the side we see). Bear in mind that this does not mean perfect alignment. The phases of the moon have nothing to do with the Earth's shadow. So a perigee-syzygy of the Earth–Moon–Sun system means an alignment that occurs when the Moon is near to the Earth. It could be a full moon. It could be a new moon. Easy, right? Inasmuch as a made-up term from a made-up belief system can have a proper definition, a supermoon generally means a full moon. WHY ARE THERE SO MANY SUPERMOONS THIS YEAR? Not every full moon is at perigee (or its opposite, apogee, when the Moon is farthest from the Earth). The lunar cycle—the number of days it takes the Moon to experience each of its phases, new moon to new moon—lasts about 29 and a half days. Every 14 lunar cycles, the full moon coincides with perigee. Supermoons tend to come in threes, however. The reason is that the full moons preceding and succeeding perigee-syzygy are still inordinately close to the Earth, and thus appear a lot larger than normal. Moons that are 224,641 miles or closer to the Earth are considered supermoons. 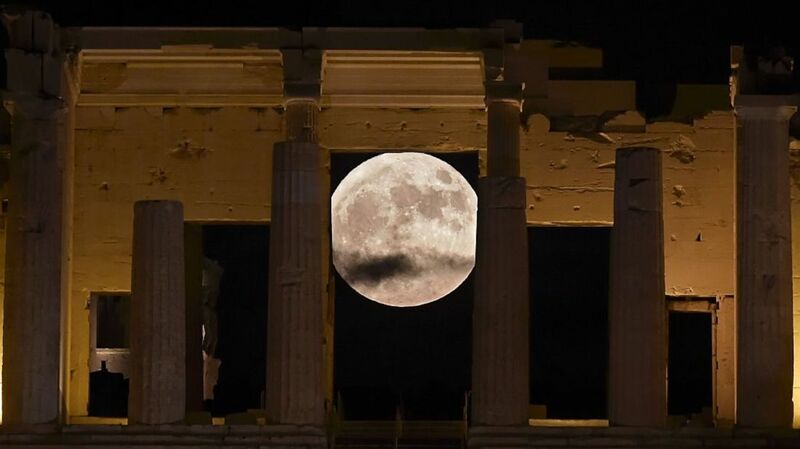 The result: a supermoon trifecta, three in a row. So if you've experienced supermoon overload this year, take comfort that it'll be more than a year before you have to hear the term again. Enjoy it: 2016 has been a year of wildly unexpected and sometimes awful events. Something as predictable and wonderful as the cosmos can be a great comfort indeed.